This article will cover in great detail why our 5/16” Hybrid End Mill, when used in conjunction with our AR-15 and AR-308 Router Jigs, offers vastly improved 80% lower receiver milling performance as compared to standard ¼” end mills offered with all other router based 80% lower receiver jigs. While developing our AR-15 and AR-308 Router Jigs on our quest to thoroughly optimize them for use with common handheld routers, we found that a proper end mill design is paramount in achieving fast, high quality finished results. There are several factors when considering how an end mill will perform, but this analysis will address how much the end mill tool deflects during normal use. Our analysis below revealed that an unsupported ¼” diameter end mill, in the necessary length to finish an 80% lower, has the potential to deflect (bend) up to 40mils during use. For the sake of better understanding, 40mils is equal to approximately 10 sheets of plain white computer paper. The effect of the enormous deflection is slow milling, excessive and unsettling tool chatter, frequent tool breakage, and poor finish quality. When aspiring to quickly achieve flawless finished results, is it ideal for the tool to deflect up to the thickness of 10 sheets of paper at the base of the cutting surface? No, not even close! How does our 5/16” Hybrid End Mill perform under the same set of circumstances, you ask? The increased diameter of our Hybrid End Mill, combined with the fact that our end mill is bearing supported at all times by our Universal Router Adapter, results in our end mill deflecting 8x less than the ¼” example. Our Hybrid End Mill will only deflect a maximum of 5 mils at the base of the cutting surface, or the thickness of approximately 1.25 sheets of computer paper. So what does this mean, ultimately? It means faster milling operations, greatly reduced unsettling tool chatter, and flawless finished results. Continue reading below to discover how we performed our analyses and arrived at our conclusions. An end mill, at a quick glance, seems like a simple tool. When you take a closer look, it starts to become more and more complex. At 5D Tactical, we take a hard look at problems and solve them by applying science and sound engineering principles. We looked deep into the physics, material science, mathematics, and the standards that govern end mill manufacturing to come up with a solution that is like night and day compared to the ¼” end mills offered by the competition. To begin with, we must look at the intended application. To refresh anyone who has made an 80% Lower Receiver and to inform those who may be in the market, the buffer mount protrudes from the top of the lower receiver. Finishing an 80% lower requires milling to be completed for the fire control group pocket, just in front and below of the buffer mount. The most overwhelmingly popular method to finish and 80% lower receiver is to use a router. 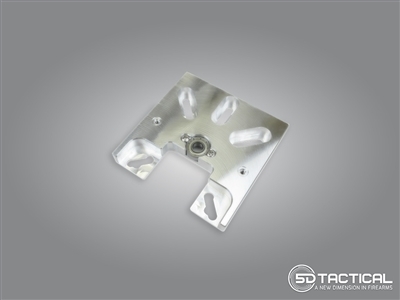 However, due to the diameter of a router, a short end mill would not be able to reach the bottom of the fire control group pocket before the router would interfere with the buffer mount of the 80% Lower Receiver. This drives the need for an end mill that is a minimum length of 2.65”, see below. This doesn’t account for the need to hold it in the router collet or the need to protrude through the bottom of the 80% Lower Receiver, so the total minimum length cannot be less than approximately 3.5”. Additionally, if the diameter of the end mill is too large it will create a multitude of problems. Some of these problems include: too wide of a trigger slot making a large gap around the trigger, too large of a radius in the corners of the fire control group pocket causing interference and improper function of the trigger assembly and poor compatibility with the common ¼” router collet size. These problems have caused our competitors with router based jigs to take the easy road and simply offer a ¼” diameter end mill that is at least 3.5” in length. As any machinist could tell you, a cutting tool with this length to diameter ratio is not ideal for use in any milling operation. The mere existence of these extra-long length ¼” diameter end mills is for specialty applications and removing only small amounts of material in confined areas when no other option is available. They are prone to chatter, frequent breakage and poor surface finishes, especially when being used with a handheld tool such as a router. The reason the competition can call their tools “custom” is because they need to be custom made to their specifications due to being useless for any other application. A car with square wheels would be custom, but that doesn’t make it an improvement! While developing our Universal AR-15 and AR-308/AR-10 Router Jigs, we decided to take a step back and try to put a little more effort and thought than that. From our education in engineering, we know that the following analyses govern our application. If we apply the above equations for deflection, 1, and area moment of inertia, 2, to our application, we can see that the deflection at the end of the end mill, δ, depends upon the force applied to the end mill, P, the length of the end mill, L, and a couple of engineering values that we will explain. E is the elastic modulus. The elastic modulus is the ratio of stress over strain. In layman terms, this is how a material will deform when it is stressed. I is the area moment of inertia. This is harder to explain in simple terms. It is a value that is calculated based on how a geometry can resist being bent. You can see from the moment of inertia equation, 2, that the radius of the tool is to the fourth power which means if you double the diameter of the end mill, it would be 16x stiffer not 2x. The takeaway is that a small change in diameter provides a large change in stiffness. For a ¼” end mill made from cemented tungsten carbide, using an unsupported length of 2.75”, a force of 20lbs, an elastic modulus of 93,000 KSI and a calculated moment of inertia of 191.75 µIn4, the calculated deflection at the cutting surface of the end mill is 7.77 mils. Applying the same length, force and elastic modulus to a 5/16” end mill, the calculated moment of inertia is 468.13 µIn4 and the end mill deflection would be 3.19 mils. From this, we can see that a typical 5/16” end mill would deflect 2.5x less than a ¼” end mill. This is a substantial difference. The above equations simplify the actual application, but are still helpful for qualitative purposes. In practice, a 5/16” end mill isn’t a great option because the collet size in a standard compact router is ¼”. A 5/16” end mill cannot fit into a ¼” collet. However, if you taper down the 5/16” end mill to ¼”, it will fit into a standard compact router and provide most of the advantages of a 5/16” end mill. This is what our 5D Tactical Hybrid End Mill does. It has a 5/16”shank from the portion below the router collet down to the cutting surface while incorporating a reduced shank area for interfacing into a standard compact router. Additionally, the 5D Tactical Universal Router Adapter incorporates a high-speed bearing, shown below, that the 5/16” end mill rides upon to further reduce any deflection. The combined benefit of a 5/16” end mill and support bearing are more complex than the above equations can easily calculate. The normal practice is to simulate using engineering software to provide more accurate results. First, we had to determine more accurate data to input into our simulation. The material properties of the various types of carbide materials are readily available. Our exact blend of carbide material is proprietary. A lot of time, money and effort went into the blend, so we are not able to share its exact specifications. Instead, we will use the standard 93,000 KSI value for elastic modulus and an ultimate strength of 464 KSI. These material properties will be applied for both the ¼” and 5/16” end mill for consistency and fairness. We also need to know what the force value to apply to the end mill, or so one might think. After doing much simulation, the results show that how hard one pulls on the router and thus the end mill means very little compared to the torque that the router inputs to the tool. This is obvious when you apply more engineering equations, but for the purposes of simplicity we will not go into those. We do however, know what that torque value is. The most powerful standard compact router is 1.5HP. This rotates at varying speeds but the average user is typically comfortable around 15kRPM. Using these values, we know the torque applied to the end mill when cutting heavily can be a maximum of 6.3 in-lb. Applying the 6.3in-lb and standard carbide material properties allows us to run the simulation and gather quantitative results on both the ¼” and 5/16” end mills. We will start with the ¼” end mill. On the left is the end mill deflection, in inches. On the right is the end mill stress, in PSI. The end mill deflection shows us that an end mill held fixed at the top of the shank with a torque of 6.3in-lb will deflect by a value of 40mils at its base. The end mill stress shows us that the highest stress is at the collet to shank interface and can be as high as approximately 300PSI in normal operating conditions. This deflection is very high for normal milling applications and this stress level on the end mill is much higher than comfortable. Any abnormal conditions, like catching an edge of a hole or similar is expected to cause the end mill to fracture. Carbide is an extremely hard material which will offer high resistance to wear, but the trade off is the material being relatively brittle. The end mill in this application is likely to have extremely high chatter, poor surface finish and would likely break before it would wear out. Next, we will look at the 5/16” end mill. On the left is the end mill deflection, in inches. On the right is the end mill stress in PSI. The end mill deflection shows us that a 5/16” end mill held fixed at the top of the shank with a bearing support near the center and a torque of 6.3in-lb will deflect by a value just under 5 mils at its base. This is roughly 8x less than the ¼” end mil. The end mill stress shows us that the highest stress is at the tooth of the end mill, where it should be. The shank of the end mill is safe under normal operating conditions. This deflection, while still rather high for a milling operation, is much lower than any of our competitors. Any abnormal conditions, like catching an edge of a hole can still break our end mill, but with a much lower rate of occurrence. Our 5/16” Hybrid End Mill will have minimal chatter, produce a higher quality surface finish, and be less likely to break as compared to a ¼” end mill.